We get a ton of really great questions from our users. Recently, we’ve seen an influx of questions regarding 404 errors and 301 redirects. At the surface, 301 redirects may seem very technical but we promise they’re not that difficult and today we’re laying it all out to help you understand. To start, it’s important to understand that 404 errors are incredibly bad. Not just from a user experience perspective but search bots like Google will also penalize you for these types of website errors. 404 errors happen when a page is deleted from a site and the server but links still exist to the page. If you come across a 404 error on your website it’s critical you nip it in the bud immediately. As soon as search bots get your “404 Page Not Found” error a few times, they will deindex (or remove) that page from search results. We wouldn’t want that to happen now would we? Learning more about redirects such as 301 redirects is a good step to take towards optimizing your website. Redirects send your site users and search engines to a different URL than the one originally requested. There are different types of redirects. 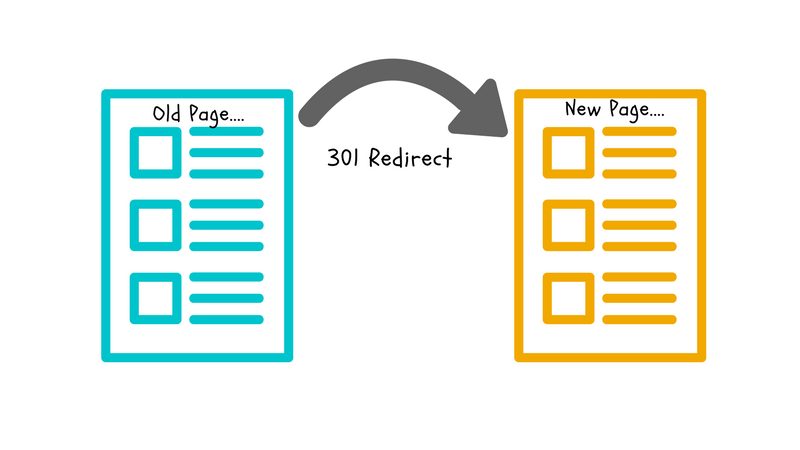 For the purposes of this article we’ll be discussing 301 redirects specifically. 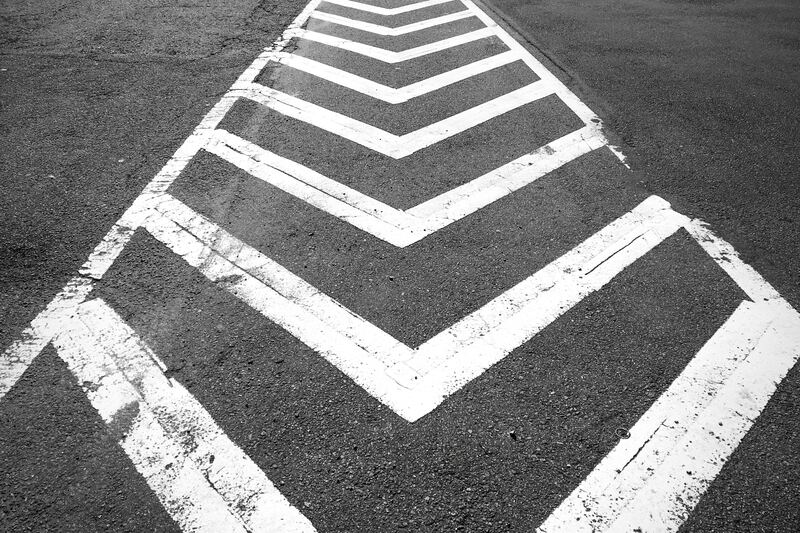 Redirects do exactly as the name implies — they redirect from one place to another. For example, maybe your firm’s brand is changing, you’e got a new company name and therefore you have a new website name. In this scenario, you’ll want to ensure a 301 redirect is setup from all the iterations of your previous brand’s domain. A 301 redirect essentially signals that a page has been “moved permanently.” Setting up these types of redirects are ideal for search engine optimization (SEO). In most cases, setting up a 301 redirect is the best method for instituting redirects on a website. What do redirects have to do with SEO? A lot! When needed setting up 301 redirects tells browsers and search engine bots like Google that the page has been moved permanently. Doing this tells search engines that not only has the page moved but the content on that page can now be found elsewhere at a new URL. If your original page already carries some weight, search engines will continue to carry that weight to your new URL if 301 redirects are setup properly. However, this process isn’t instant. Once your 301 redirects are setup it will take search engines some time to discover the new URL and give your new page or pages new rankings. What happens if I don’t setup 301 redirects? Setting up 301 redirects are key to maintaining any domain authority your website has already achieved. And domain authority is a top ranking factor for search engines like Google. Let’s use Toys ‘R Us as an example. In 2010, the toy retailer purchased the domain toys.com but forgot to setup redirects first 😵 The result? Their SEO results took a huge nose-dive. Whether your a huge retailer or a small financial planning firm setting up 301 redirects before migrating your website should be at the top of your migration checklist. After all, you wouldn’t want your site’s traffic or SEO ranking to plunge, would you? How do I setup 301 redirects? Luckily within the Twenty Over Ten platform, setting up 301 redirects is simple! 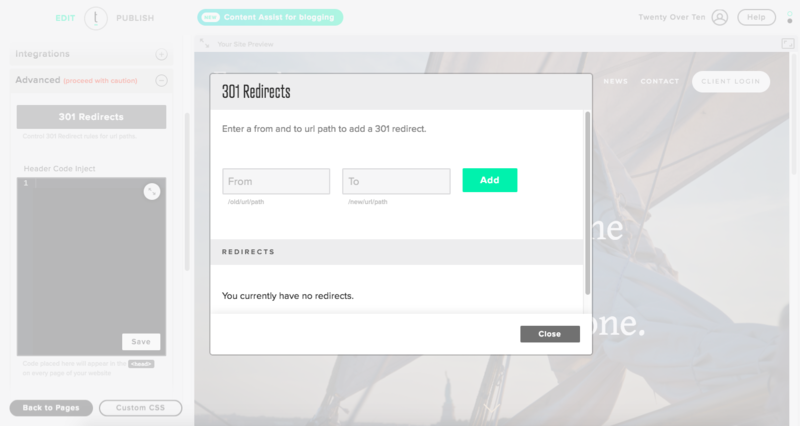 301 Redirects can be setup for all pages, blog posts and landing pages within your website. So if you’re migrating from another website provider, you can simply match the URL’s or create 301 redirects and there will be no effect on your existing SEO. Within your Twenty Over Ten dashboard users can navigate Site Settings -> Advanced -> 301 Redirects. Yes, it really is that simple! Once you’re there you’ll have the ability to add two URLs. The URL placed in the first box should be the the old URL, where you’re directing traffic from, and the URL in the second box should be the new URL, where you’re directing traffic to.